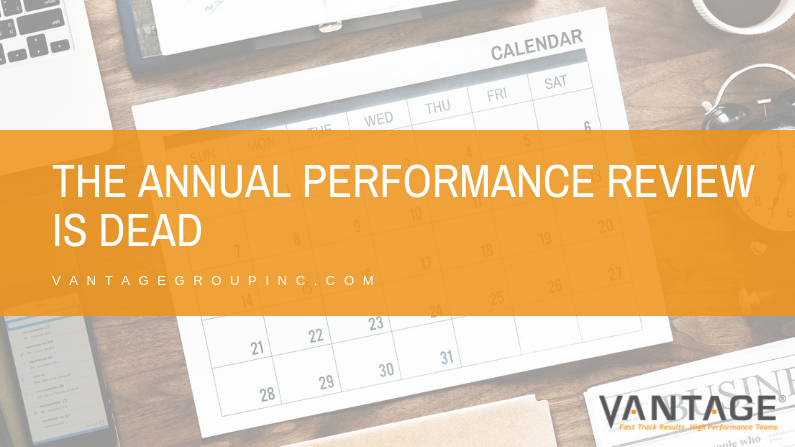 The Annual Performance Review is Dead | The Vantage Group, Inc. When you think of an annual performance review, it’s likely your eyes gloss over a bit. As the manager, you have to pull some talking points together, organize your thoughts on how well your employee met his or her goals, and decide whether or not they deserve a raise. As an employee, you want to hear that you are valued and that a financial boost is on the horizon. These sort of charades are a traditional and outdated way for employees to learn about how their managers perceive their performance. In most instances, the review itself is vague as the manager is often two or three times removed from an employee’s day to day tasks and projects. Is it really helping anyone? The answer is no. Whether you are a multi-million dollar company or a small family run business, annual performance reviews take a lot of time for little return. Unfortunately, these reviews are often associated with wage increases and that’s bad for the bottom line. There are a lot of ifs, ands, and buts that can be involved in the review process. More often than you can believe, feelings get hurt and frustrations bubble to the top. Reviewing an employee in a systematic process once a year may seem ideal, but it is far from it. If this is the only check-in between an employee and their manager, there’s no transformational growth or true opportunity to help an employee meet and exceed personal and company goals. Traditional performance reviews may keep Human Resource requirements satisfied, but any form of feedback and goal planning for an employee should be results driven, not paperwork driven! Here at Vantage, we recommend eliminating outdated annual performance reviews and opting for regular meetings between employees and their direct supervisors or managers. In this way, everyone can work toward the same goals and maintain consistent progress between check-ins. Regular meetings may have you saying to yourself, “Whoa! That sounds like a waste of time and I’d rather just have to do this once a year, rather than multiple times throughout the year.” Before you jump to that conclusion, know that regular meetings don’t have to be “an extra”! All you need to do is set up regular one-on-one touchpoints weekly or monthly between managers and employees. Moments like this likely already exist between employees and managers. All managers — at least all good managers — meet with their employees in-person or virtually. Adding a little structure to these meet-ups can be a strategic way to increase productivity and save everyone time. These touchpoints should focus on reporting progress and needs related to a company-wide initiative or goal. Why? When we focus on the whole company as part of the employee review process, it is easier for everyone involved to understand priorities, accomplish benchmarks, and meet expectations. These short and regular meetings (think 15 minutes or less! ), will focus on specific goals that help to grow and support both the employee and the company. One benefit to regular check-in meetings is how they help managers dealing with behavioral issues. For example, if an employee exhibited rude behavior or has a complaint against them, the regular check-in meeting provides the opportunity to have a conversation about what is acceptable and how to move forward in the “now” rather than 6-months from now. In this process, employees can be held accountable on a regular basis. A huge plus to regularly scheduled check-in meetings is the reduced amount of paperwork and time spent on defining goals. Short, achievable goals will help employees stay on track and keep them engaged and progressing. What If My Company Structure Isn’t Clear? Smaller organizations with fewer employees also benefit from implementing the regular check-in approach. With a flat, unencumbered organizational structure and fewer people in the mix, reviews become more of a “we should” rather than a “we do.” However, performance reviews are necessary in order to understand where employees land in the process of achieving organizational goals. Nearly everyone in an organization has someone they report to, even in small operations. Thinking of ways to formalize that structure, and adding a bit of organization around weekly or monthly conversations will give ample opportunity to include check-in points that help keep the team informed and on track. Larger organizations have a clearly defined management structure starting at the top working down through titles like director, manager, project lead, supervisor, etc. In these scenarios, “who” reports to “who” is established, making the opportunity for regular one-on-one check-ins easier. Time is often the largest barrier, but again, these check-ins are meant to be short and focused, emphasizing predefined goals and the progress made in the time since the last check-in. Do you want to retain your new talent? While working with millennials or young professionals, you need to know that they desire regular feedback. Giving them regular feedback increases job satisfaction which helps retention and engagement. Also, they want to be involved in doing something that’s bigger than themselves and to know that their work is making an impact. Regular check-in meetings allow managers to build a stronger supportive and encouraging relationship with young professionals who are looking to learn and make their mark in the career world. To be clear, we’re not saying you should get rid of the review process entirely. We’re just saying that an annual review isn’t worth the hassle and headache. Make review regular and you’ll notice a difference in your employees and progress toward company-wide goals. Are you curious about how to shift from annual performance reviews to regular check-in meetings at your company? We’re happy to help, contact us to learn more.